East Eats West, and Gets Diabetes! It’s a diabetes disaster! Rapidly escalating levels of meat, poultry, fish and egg consumption have combined to give China the highest rates of diabetes in the world. Yes, their rate of this so called “western disease” is now even higher than ours. 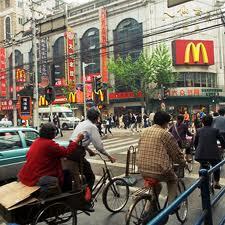 China’s levels of meat consumption doubled between 1990 and 2002. Today the average Chinese eats an astounding 215 pounds of meat, poultry, fish and eggs every year. Back in 1961, the Chinese consumed just a few pounds of animal products each year. Even as recently as 1980, they still following a mostly traditional, nearly vegetarian, diet, and the diabetes rate in China was only 1 percent. But consuming animal products, especially those high in saturated fats, can dramatically increase the risk of diabetes. There’s a financial cost to all of this as well. The booming level of meat consumption in China has brought with it a medical problem which could bankrupt their health system. Covering all the new and emerging cases of diabetes will consume more than half of its annual healthcare budget. And then there’s all the complications diabetes sufferers face. The researchers recently warned, in a Journal of the American Medical Association report, that China will also have to face “a major epidemic of diabetes-related complications” including cardiovascular disease, stroke, and chronic kidney disease, in the near future, without an effective national intervention. Just as China has turned to western, meat-centered diets, it has also turned to western ways of handling the problem. China’s rising prevalence of diabetes has helped fuel a 20% per year growth in drug sales, stoking the need for medications from drug companies. China’s government is trying to fight the scourge by expanding basic medical coverage, buying medicines in bulk to lower costs, and conducting a corruption inquiry into international drug makers, including GlaxoSmithKline. Yet the real solution to this epidemic, like so many others, is a vegetarian solution. Not only is a vegetarian diet powerful in preventing diabetes, but several studies now show it is also powerful in reversing it. Let’s hope the Chinese government realize this quickly, before the situation gets any worse.